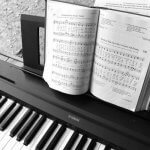 Williams Overture Review - Fake or real digital piano? Williams Overture Review – Fake or real digital piano? The Williams Overture is an 88-key digital piano with realistic weighted hammer action keys and a velocity-sensitive touch response. Its 64-note polyphony allows for enhanced creative expression as do its 15 voices and 58 preset songs. It features dual mode and split layer function for learning, teaching or experimentation. It has a 2-song recorder for keeping track of progress development or song trials. Three damper pedal provide sustain, soft and sostenuto note effects. The Williams Overture features expanded connectivity as well. It contains a MIDI in/out line, a USB to device connection and two headphone jacks. 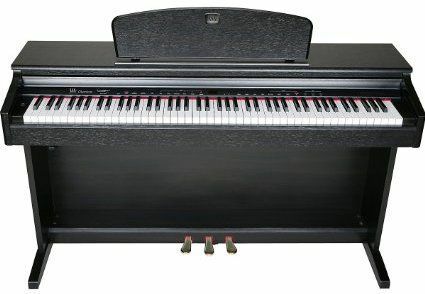 The 88-note keyboard provides the most similarity to a real piano. The weighted keys are also velocity-sensitive, offering a playing experience much like the standard instrument. The touch-sensitive keys feature selectable levels of response. Lastly, the player can also choose from layer, duet or full modes depending on playing or learning needs. 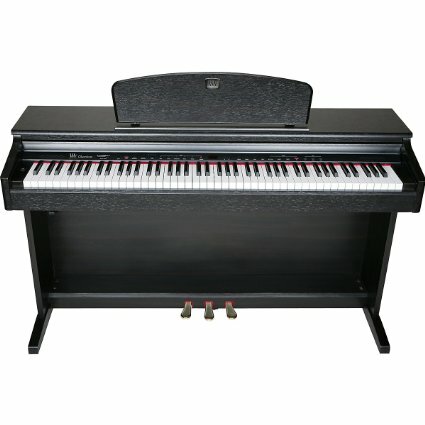 The piano comes with three standard damper pedals: sustain, soft and sostenuto. The variation comes in handy for those who like to play more advanced pieces as well as beginners that have plans to do so as their skill develops. The pedals themselves assist in the process of developing playing skills. The Williams Overture features built-in speakers to produce a clear and rich sound true to the standard piano. For those that need to play discreetly, one or both headphone jacks can be used. Even with the sound transmitted via headphones the integrity of the sound is still maintained. 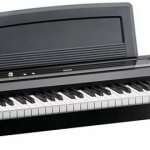 While many digital pianos can cost in the higher ranges, the Williams Overture is known for being much more affordable. This piano, unlike many others, can be purchased for significantly less than $1000. The final price will depend on added accessories or place of purchase. The Williams Overture provides an authentic piano sound that users of all skill levels can enjoy for practice or performance. The touch response is also like that of the real instrument, great for providing a realism experts need and the ability to learn proper technique for amateurs. The weighted keys also add to the piano’s authenticity and enhance the overall playing experience for those accustomed to or planning to advance to a traditional acoustic. Users also boast about the piano’s size and appearance that allow it to be set up nearly anywhere. Alternatively, the main drawbacks to the machine are its heavy weight and limited polyphony. 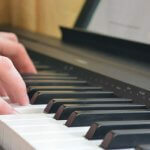 Realistic Sound: Users report a remarkable sound from the piano, one that closely resembles the tones of an acoustic. Touch Sensitivity: The touch response has been noted as impressive by many users. The force with which notes are pressed affects the sound produced and the Overture has been said to mimic the action of an actual piano. 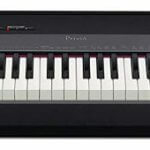 Weighted Keys: The 88-note keyboard features weighted action that corresponds to the keys’ location on the piano. The lower notes produce a heavier feel while the higher notes have a lighter feel. Appearance:The piano’s appearance is sleek and modern, allowing it to blend in with any décor. Size: The Williams Overture is slender enough to fit into tighter spaces. Weight: The piano’s 132 pounds make it more difficult for some to assemble or transport the piano. 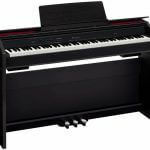 The Williams Overture is a high-performing digital piano at a fraction of the price of many others. It features important functions such as hammer action, selectable touch response, damper pedals and track recording. It is also a beautiful instrument to fit in with surrounding décor. The sound samples stay true to the authentic piano, making it perfect for performing advanced players and learning novices.